I always think that a blog is a better medium for a cook to share his story. A cookbook is too final. Not only is the recipe already cast in ink. Somehow, it communicates the idea that this is the only way to cook this dish, that this recipe is "best" for this particular dish. A blog allows a cook to just tell you what he just did, which is somewhat different from what he did the last time he cooked the same dish. It is not even a "work in progress," for that carries the idea that there is a finishing point. There isn't one, for cooking is not about arrival, but a journey. You just keep cooking, move ingredients around, pay attention to some good techniques and you end with yet another good dish. Blogging allows the cook to share many points of this journey, while a cookbook focuses only on some high points. I cooked a Nonya-based meal recently and had the opportunity to combined Sambal Prawns and Brinjal. I love both ingredients and when cooked this way, there is contrast in texture, one bring crunchy and the other luscious. I have already blogged these recipes here and here. I did not refer to my previous recipes and so, it was very much just cooking from experience. I will note down what I did and trust it will be helpful for you. It make sense to combine prawns and brinjal as the techniques use are the same: deep-frying and then mix. And as with many sambal dishes, the sambal pastes are very similar and there is no reason why you cannot try different combinations. As for the preparation and methods, I will note down more details. But I trust that will not make this dish sound more complicated than it actually is. Grind the shallots and lemon grass finely. Toast the belachan in a dry wok. Then add oil and when heated, add in the onion-lemon grass paste and chilli paste. Simmer for 20 minutes, adding the salt, sugar and tasting along the way. Add some water to ensure a smooth consistency. Shell the prawns. Marinate with a spoonful of sugar, half a tsp of salt and a tablespoon of corn flour. This will help remove fishy odours and ensure the prawn stay crunchy when cooked. Keep in the fridge till you are ready to cook it. Before you do, rinse the prawns with water in a colander to remove the marinade. If you add the prawns coated with the marinate, it will burn in the wok. Add oil to a deep wok and set flame to high (but not smoking) for deep frying. Add the prawns and and cook for a minute. It is important to cook the prawns quickly so that the flesh is firm and not mushy. Don't overcrowd you wok. After all the prawns are cooked, set aside. Next, slice the brinjal into pieces. Shape and size is up to you but keep the skin on please. 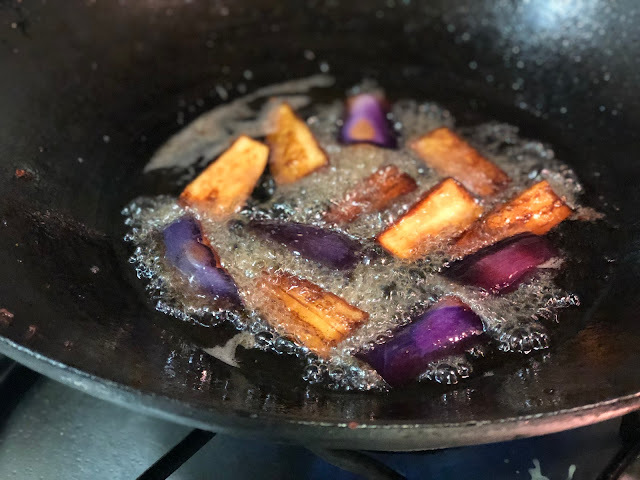 Deep fry the brinjal immediately for about 2 minutes on high heat. I normally slice the brinjal just before I deep fry it so that the brinjal pieces won't develop black spots (due to oxidation). Deep fry till the pieces are browned. Drained and set aside. 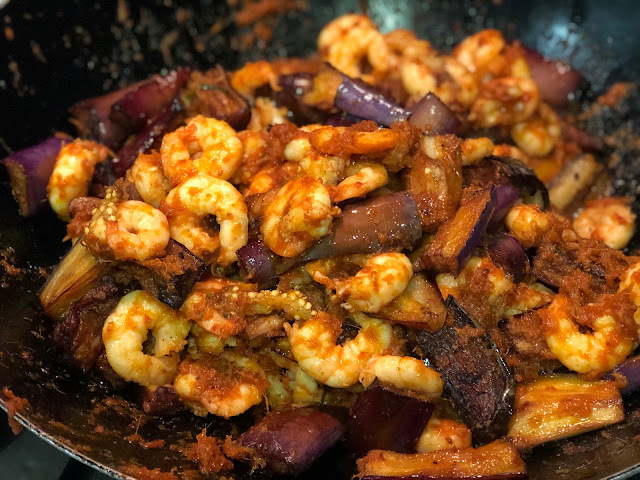 In the heated sambal in a wok, add the cooked prawns and brinjal. Stir fry for about 2 minutes. Towards the end, sprinkle onto it the diced kaffir lime leaves. 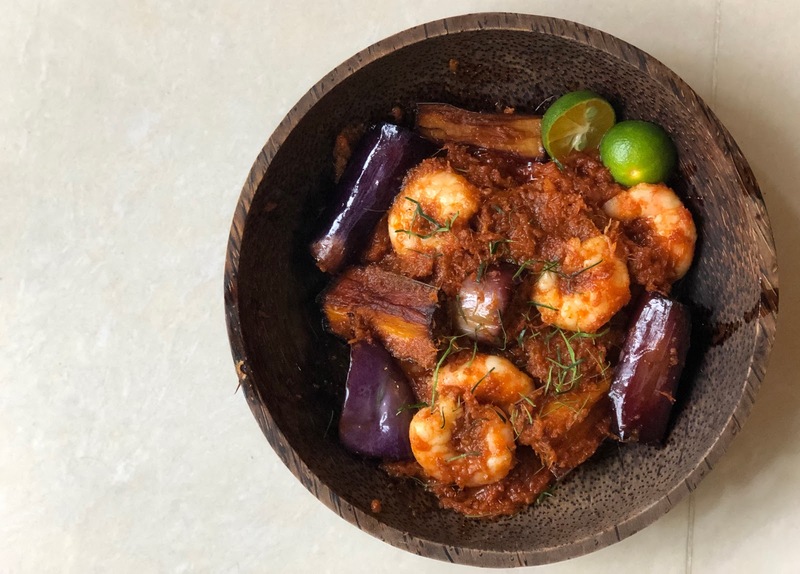 This dish is best served warm and goes well with steamed rice or Nasi Ulam. Assembling and finishing off in the wok.